I continue my series encouraging people to look closely at nature, with today’s quiet, lovely book choice. Opening Sentences: I’ve come to the river with my mom and my dad and my brother to play. Susurrus, susurrus. The running river is singing a song. “Come, Yu-chan,” calls my dad. Hmm… do I want to go? Synopsis: A small girl, perhaps three years old at the most, has come to the river with her family. 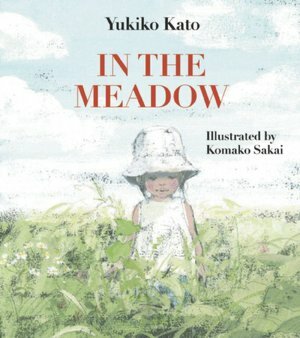 While her dad and brother play in the river and her mother sets out a picnic, the little girl follows a butterfly into the tall grass of the riverbank. She experiences many sights and sounds and feelings as the butterfly leads her deeper into the grasses. All around her are rustlings and squeakings, the onomatopoeia of the words adding to the reader’s appreciation of her experience. She feels the tickle of the grasses, and the odd touch of a grasshopper that lands on her arm. She sees a myriad of different grasses swaying like the waves of the ocean. Then she realizes she is alone. She closes her eyes, and is even more aware of the sounds around her – but where is her family? To her surprise and relief (and ours) when she opens her eyes her mother is there. It’s a simple, quiet book, originally published in Japan as part of a series intended to “focus on what it feels like to be in a particular place” in nature. To experience some of the book for yourself, particularly the art and the way the words mimic the sounds the little one hears, you can read this review from the blog Seven Impossible Things Before Breakfast. Activities/Resources: The best activity to go with this book is to go out into nature, either into the countryside or into an urban park, and to look at the different types of plants, feel what they are like – touch the bark of a birch tree and an oak, for example, or brush a piece of foxtail grass across the skin, then a blade of ordinary grass; see if there are birds or bugs about; invite children to close their eyes and listen, then ask them what nature sounds do you hear? What might be making those sounds? Can you think of words that imitate the sounds you hear? Availability: This is readily available in hardcover. What a charming book, Beth! It’s so important for children to slow down in life and enjoy God’s world. They (and we) are far too busy. Thanks for your review of this gentle story…. Thanks, Jarm. You are so right. I love your idea of focusing on nature. This book looks lovely. Thanks, Carrie. It is soft and sweet and, indeed, lovely. What a beautiful and important book encouraging children to explore nature. Sounds lovely. Great book for the “Reading the World” project. Thanks, Pat. I admit I’ve fallen way behind in the “Reading the World” project. You’re doing so well! Sounds beautiful. And I love books about the natural world. Off to the library! Hope you enjoy it! I”m sure you will! Your activity suggestion is great, with or without the book, kid or adult! Thanks, Julie. It’s an activity that I suggest in season and out! I love the cover! I will try to find this book in my library for sure. Thanks, Saba! Hope you find and enjoy the book! I lovely gentle book, to help children enjoy the outdoor life! Yes, it is sweet and gentle. Oh! I love the look and sound of this book! I live on a river and I, too, like to explore the river bank and woods up the hill. And to swim in the cool water is mesmerizing. I will look for this book at my library or maybe the book store. Thanks so much for discovering it for us! Thanks, Janet. Your explorations of river bank and woods sound delightful. Hope you find the book! What a beautiful, quiet book. Thanks Beth! It sounds lovely, Beth. I’ll be on the look out for it. Thanks for sharing! Thanks! I hope you find and enjoy it! Great pick! I love it!